Guy Philippe says he has nothing to lose, and he may be right. The Haitian warlord has recently been profiled by the Associated Press from his rebel stronghold in the mountains of the Caribbean country, where he promised to fight if he lost the upcoming senate elections. As Abreu Report wrote months ago, Mr. Philippe has been busy amassing an arsenal, something which the Associated Press has now confirmed, reporting that in one shack, "two T65 assault rifles and a pair of M-1 carbines were visible." The AP further reported that Mr. Philippe has been busy trying to convince former members of the military to move to his mountain stronghold, where roadblocks and other defenses are already in place to protect the former coup plotter's base. Mr. Philippe, who came to global prominence after leading a coup against the democratically-elected government of Jean-Bertrand Aristide, had the tacit support of the Dominican government and the George W. Bush administration. 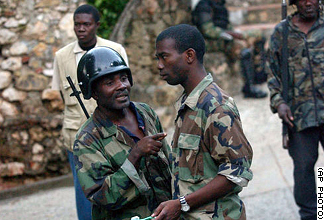 Perhaps Mr. Philippe wanted to retire, but the US government made sure he was sprung back into action after the Drug Enforcement Agency charged him with drug trafficking, and now the only way he can make sure that he stays out of a US prison is by gaining a seat in Haiti's senate during the upcoming elections, which the Dominican government is in motions to organize. Mr. Philippe's coup was supported by the Dominican Revolutionary Party, led by Hipolito Mejia, but they are no longer in power, and the Dominican Liberation Party, led by Danilo Medina, fears that a civil war in Haiti would create a humanitarian crisis that could destabilize the Dominican economy. Furthermore, a 2013 decision by the top Constitutional Tribunal in the Dominican Republic means that the Dominican government is relying on the Haitian Constitution's recognition of 143,000 Dominican-born Haitians as its citizens in order to avoid accusations of rendering individuals stateless. Should Mr. Philippe successfully declare a rebellion against the state, perhaps seceding and creating his own mountain fiefdom, he would make it impossible for the Dominican government to deport individuals born to undocumented Haitian parents. When US Secretary of State John Kerry showed up in the Dominican Republic in July, he threatened President Danilo Medina with the prospect of installing a dictator in Haiti, and now the Associated Press has all but warned that a civil war is coming, and that Guy Philippe will be the man to lead it, for he "has nothing to lose." The war will be long and bitter, but the reconstruction period will be sweet and lucrative, especially for the Clinton Foundation.